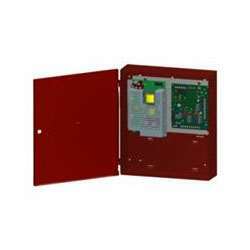 The HONEYWELL-POWER-HPFF12 is a 12.0A fire rated power supply that includes a red enclosure and battery cable. The unit is designed to extend the power capabilities of existing NACs. The HPFF12 provides power for auxiliary devices and connects to any 12 or 24V Fire Alarm Control Panel (FACP) or operates stand-alone. The unit also provides regulated and filtered 24VDC power to four NAC's and an auxiliary output. The unit has two fully independent supervised initiating circuits that can be used for synchronized strobes and coded horns. Their NAC outputs may be configured as Four Class B (Style Y), Two Class B & one Class A, Two Class A (Style Z), or Four Class A.
Protocol pass-through for synchronizing large systems.